The day that Ghostcrawler promised us months and months ago. We finally not only have new Paladin talent trees that look closer to finalized versions of all 3 trees, but we have trees that actually work. Now please remember that these are active as of the date of this post and will probably change in someway before Cataclysm is released. That being said, lets take a look at the new protection talent tree and see what we have in store for us. 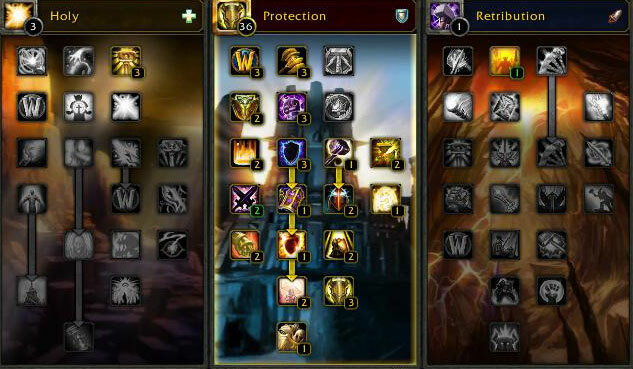 While the tree does not look hugely different than what was in the last build, there are sweeping changes to just about every talent in Protection, and a few more in Ret that directly effect us as Tanks. Read the rest of this entry ? In interest of equal time, I bring you news of the great plague of the Alliance. 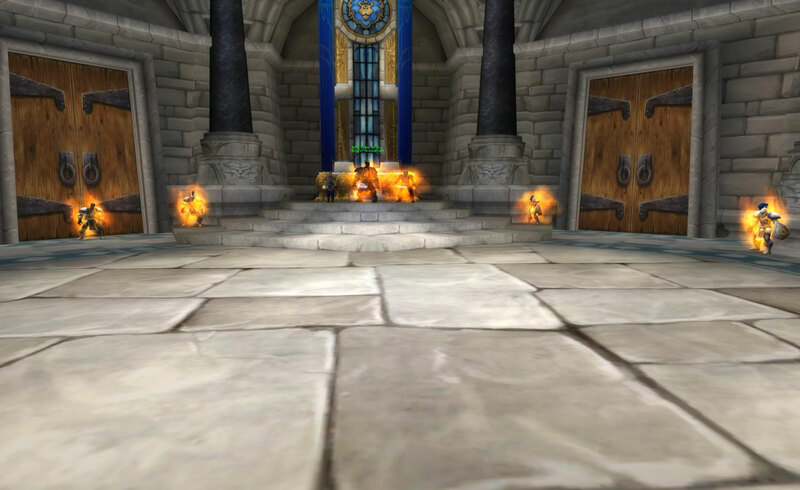 It is fast sweeping the beta realm but it seems that the youth of Azeroth are immune. As you can see the Prince has not been infected. Seriously, there is something going on here. There is no actual debuff to be seen on any of the infected NPCs. If I would hazard a guess as to whats going on here, I would have to say this will be part of the opening event for Cataclysm. 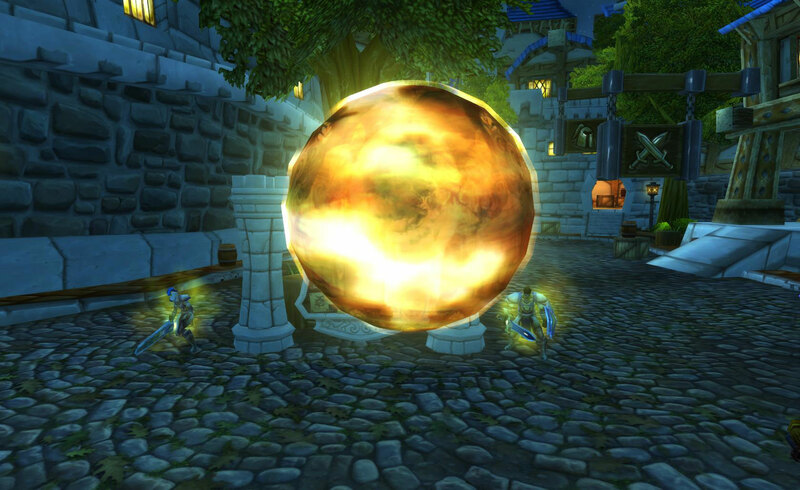 Update: Added a screenshot of a large brown orb that seems to be the source of the infection. I really wanted to have a decent discussion on the state of the Paladin tanking build. However, seeing as we are at least one Paladin talent build behind what is actively being developed and currently you can not choose Shield of the Righteous when talenting at the moment. Not to say the current Protection Talents make the class impossible to play, but it just doesn’t feel adequate. Its not the class that it used to be. Without Consecration and Shield of the Righteous in the rotation and with a nerf-batted Hammer of the Righteous, its far from the same tanking class it currently is on Live. Ghostcrawler has eluded to some big changes recently in a few posts. The paradigm shift that Ghostcrawler is eluding to is quite nice. Shifting from their proposed Holy Power = Mitigation into a Holy Power = Threat First, Mitigation Second is a huge step in the right direction. Moving towards a system where we can use our Holy Power for multiple applications based on the situation is where the new resource system needs to move towards. We can only hope that when they hit, there is still not the “You can not learn this talent” bug is fixed so we can actually do some testing. An interesting link for all you Achievement Whores out there. (You know who you are.) A Hunter Blogger by the name of Lyraat has created a decent little “Guide to 9000 Achievement Points“. Its not super indepth but it does give you a good idea on how and where you should be looking to gain those achievements the easiest way possible. 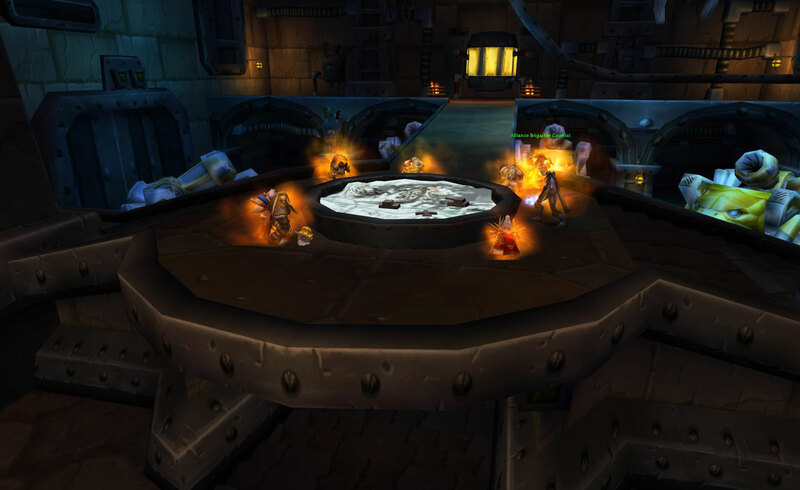 With the beginning of the Arena and PvP seasons today, I thought I would discuss a little about Resilience and the Defense Cap. The defense cap for level 83 raid bosses is 540 Defense Skill or 5.6% critical hit reduction. This is not so easily obtained these days. With the removal of warrior and paladin talents for pure defense talents this becomes quite a bit more difficult than it was in The Burning Crusade. There have been countless articles on TankSpot.com, TankingTips.com and various tank blogs that give you step by step instructions and gear guides on hitting the cap. But what if you simply can not afford those epic Titansteel pieces? What if drops just are not going your way? Well the solution is here. Arena gear is now upon us. To be sure, it is no where ideal for PvP. 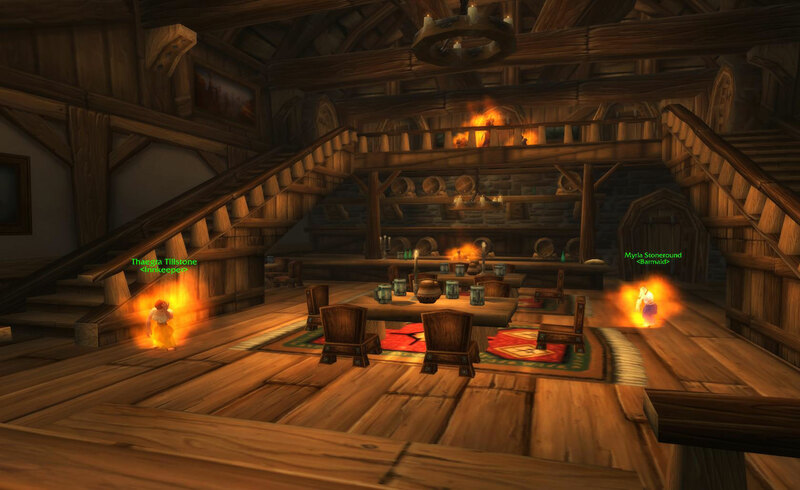 They have made great strides in making the gear to be less attractive than it was in TBC. However, resilience can cover up some early wholes in your gear quite adequately. The easiest of all the resilience methods to become crit immune. At 80 this flask gives you .6% worth of crit immunity. Roughly equal to 15 Defense Skill. There are 3 Resilience enchants currently available. Two of which are from TBC and are for such small amounts that using them over a defense enchant would actually be worse. The Enchant Chest – Exceptional Resilience is the best you can do currently in Wrath and it is only for 20. A significant amount over the 15 from the TBC enchant, but both have an extremely steep price. Giving .24% crit reduction it is more than the .18% reduction the 22 defense rating to chest enchant gives however. Yet at this point, its a wash and the Defense enchant is much cheaper. Another 20 Resilience rating option. It is not cheap though, and it doesn not cost money. For 20 Stone Keeper’s Shards, or about the price of a single heroic run’s worth of shards you willg et .24% crit reduction via a gem. The +16 defense gems on the other hand will give you much less. You will lose the avoidance given by the defense however. 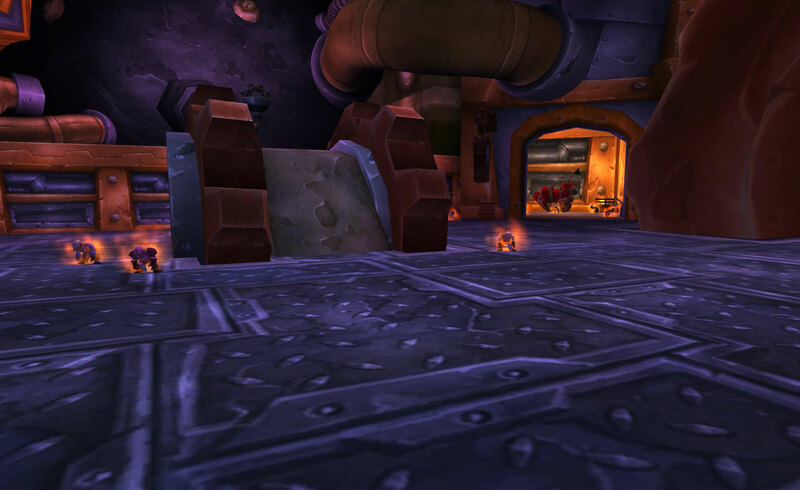 The Lesser Flask of Toughness gives us a different way to look at early gemming and gearing. We all need to be uncrittable. However, it may flat out be better for our early progression to be gemming for stamina and using this flask instead of being forced into gemming for Defense. If you are a good raid tank, you are more than likely going to be using a Flask of Stoneblood to gain your 650 health. Early on you want as much Effective Health as you can get. Now how you get this health is the key. If you do this with a flask, you are gainign 650 health. However, if you decide to use 3 +24 stamina gems instead of those 3 +defense gems you are using, you will gain much more while raid buffed. Sure you are losing a small chunk of avoidance, but while you are getting your feet wet, this is a better option for your raid as a whole. As you gain more and more defense from gear, you will be better off, and so will the raid. Yet ensuring you are uncrittable with as much health you can get is the key to early survivability in say the Spider Wing of Naxxramas, than that extra 1% avoidance. Emblems of Heroism… Which to get first? With the Paladin reaching level 80 on Sunday I had the opportunity to really sit down and think about what order I was going to be purchasing my badge gear. Let me first say that I know there are a few lists going around the web. I now have two tanks at 80. 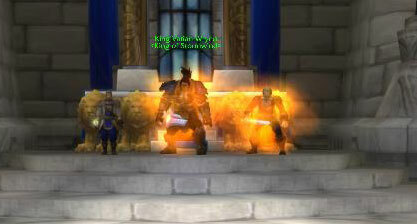 One of which was geared to the nines with Sunwell level gear, the other starting out in more lackluster gear. This list is geared towards the latter. I offer you my own personal beliefs on what order you should be picking up your “Badge Gear”. First off, what can a plate tank get from badges? Righteous Defense = Challenging Shout? Finally we get a real answer to the reality that is the flawed Righteous Defense. Today’s post by Ghostcrawler confirms that there will be changes made in the future to our taunt mechanics. Hopefully giving us a real taunt and even perhaps removing or raising the number of targets effected by Righteous Defense making it into a Challenging Shout derivative. Recently I said we were going to add a glyph to reduce the targets down to one. We’re not sure that’s the best solution now. We may just add a normal taunt, and let Righteous Defense still be there for taunting larger groups, especially since paladins lack something in the Mocking Blow or Challenging Shout niches. We don’t want to give all classes exactly the same abilities, but taunts may just be one of those things that it’s not safe to have variable. Obviously this is a good thing. Even if they do nothing at all to Righteous Defense and just give us a taunt. The only downside I can really see here is they choose to make this the fabled “11 point talent” they are in love with mentioning in vagueness but never come up with any clues for us to gnaw on. Simply put, no more “Taunt Resist Moments”. I know all the arguments against Righteous Defense’s downsides, LOS, Range, being a buff and not a debuff. These are all moot, the first time you are tanking Brutalus and your RD is resisted. Not having a secondary form of taunt is more of a hinderance than anything that is currently wrong with RD. Finally giving us something all 3 of the other tanking classes have, is better than fixing RD in my humble opinion. Do not get me wrong, RD has issues, but they can be worked around. Giving us a secondary taunt, or in this case making RD itself our secondary taunt, is far better than anything they could do for us and tanking at this point. You are currently browsing the archives for the Paladins category. Diablo 3: Real Cash Auction?